It’s halfway through January and I’m trying my best to stay on track with healthy eating! Though to be honest with you, since it’s been raining for 8 days out of 10, all I want to do is eat soup!!! But soup only keeps me full for maybe an hour, so I have to be creative and think of something filling, lots of veggies, with flavorful protein. Enter my chicken quinoa grain bowl - it’s a rainbow of veggies that lifts my mood everytime I make it! While it does have a few different components, each of the “layers” add to the overall bowl and I never get bored of it! 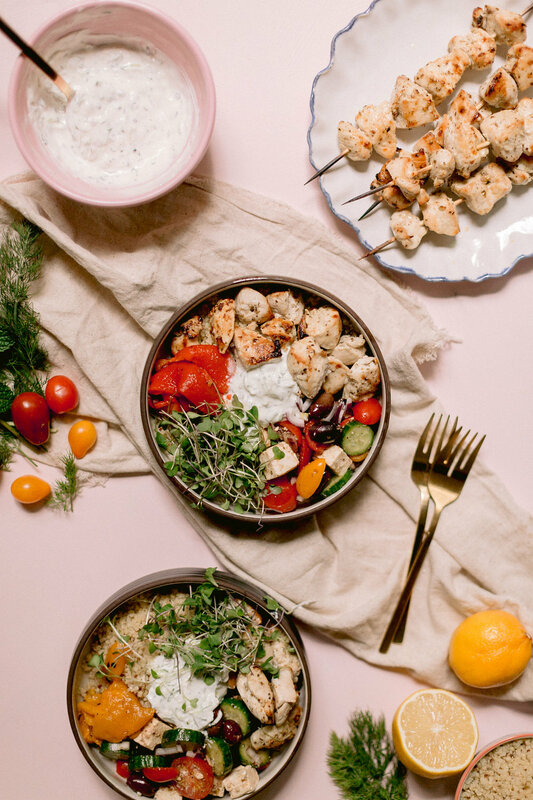 Each bite bursts with flavor - the creaminess of the tzaziki sauce, the freshness of the greek salad, and the savory flavor of the chicken just melds into a bright and sunny bite. I feel energized and happy eating this colorful bowl! I hope you will too!! Add cubed Chicken Breasts, mix and let marinate for 20 minutes. 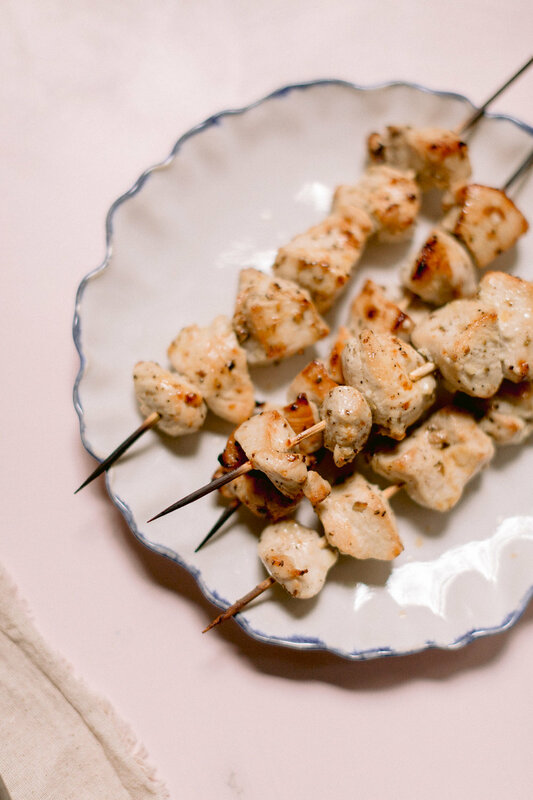 Skewer the chicken cubes and place on a lined baking sheet. Broil 10 minutes, 5 on each side. Cook quinoa according to package’s direction. Here’s a full video tutorial of the chicken quinoa grain bowl coming together! If you make this bowl, be sure to tag me on Instagram @honeysuckle. I would love to see and share your creations! !